We know the story well. Spring has come and the glass insert for your storm door has been exchanged with the screen so you can finally get some fresh air in. Only problem is, the kids, visitors and pets missed the memo. Next thing you know, the screen mesh is torn, pushed out or worse….the frame has been bent. Any of these service issues is part of our daily routine. In addition to multiple frame and screen mesh options, we also have a selection of grills to help prevent this problem from becoming a regular exercise. 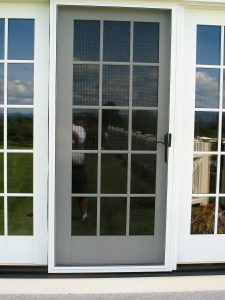 In addition to the storm door screens, we can also perform service on your patio screen and even your old wood screen door.